A hand-blown glass device housing a small team of honey bees may be able to detect cancer and other diseases, thanks to the acute sense of smell of the bees. Their extraordinary sense of smell can detect particles in the air in the parts per trillion range, naturally used for searching for pollen in flowers. By training the bees to recognize smells associated with certain diseases and cancers, the bees can determine the presence of the disease or not, based solely on the breath of a patient. The device was revealed at Dutch Design Week in Eindhoven, by Portuguese designer Susana Soares. There were multiple distinct structures presented by the designer, but the function relies on two main chambers. The first chamber is a diagnosis area, into which the user exhales. The honey bees are kept in the outer larger chamber, but fly into the smaller chamber if they detect any aroma they were previously trained to recognize. By training different groups of bees to recognize different odors, doctors can accurately determine the presence of lung, skin, and pancreatic cancers, as well as tuberculosis. “Trained bees only rush into the smaller chamber if they can detect the odour on the patient’s breath that they have been trained to target,” explains Soares. The bees can be trained in only 10 minutes using Pavlov’s reflex, connecting a certain odor with a food reward. Mentally wired to constantly search food for the hive, the bees will remember the odor for the entire six week duration of their lives. 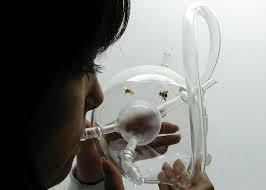 The bees are especially sensitive to pheromes from apocrine glands, which excrete information about a persons health. If you thought Google Glass was pretty far out, the tech giant’s latest project might have you seeing double. Google is developing a “smart” contact lens. Yes, a contact lens made with super-tiny chips and sensors and an antenna inside that — of course — you wear right on your eyeball. No joke. But instead showing you status updates, driving directions or allowing you to take pictures directly from your field of vision like Glass does, the intention for these contact lenses is very specific: to aid people with diabetes. The chips and sensors in the contact lenses are supposed to be able to track glucose levels in a person’s tears. Collecting tears can be difficult so why not get the technology directly to the source? Tracking blood glucose, or blood-sugar-concentration, is a way to monitor the spikes and drops that are common in people with diabetes. Google is still testing the technology in the contact lenses, which could eventually include tiny LED lights that could light up when a wearer’s glucose levels cross above or below certain thresholds, the company says.